Today we are avoiding the write-down of debt and massively intervening in the economy. Half a Hoover so to speak. More like Japan. Most pertinent is that we have allowed the big banks to consolidate (removing competition) and made them “too big to fail” (removing discipline). The consequence is the moribund private and consumer lending, and the zombie toxic debt simply being papered over. Bernanke gets credit (pun intended) for preventing a bank run after Lehman (OTC:LEHMQ) fell, but has being allowing the financial problems to fester. He intervened in commercial paper markets – they seem to have righted, and LIBOR has dropped. He is buying mortgage-backed securities (over $1T worth) – Fannie/Freddie remain alive. He is a major buyer of Treasuries – they are still being placed at lowish rates. But can he unwind? Can he exit? You can see a lot of worry over this. It does not appear the private financial markets have normalized and it has been a year and counting. I have looked at the 1929 (and here in a thoughtful post), 1937 (again and again and again, and more thoughtful here) and even 1987 analogies. And now 1989. The value of these analogies is not great – one is extrapolating from one or two data points. But they may be better than the alternative, of using fractals. The market is a multi-fractal structure, meaning shows the same patterns at all time scales, and so one can use fractal patterns to simulate what is happening now. By looking at fractals across much shorter time periods, one can find many more data points to extrapolate from. A worthy thing to do but fraught with a different sort of error: the surrounding context may be too different right now for those fractals to be predictive. Specifically, we have had a propensity to consume since the 1960s, and it was a major switch from the propensity to save of the 1930s. This switch pervaded many institutions, including investment and capital structure in the private economy (ie much less debt). And now it has switched back to savings. In addition, a lot of changes have happened to capital markets, such as abandoning the gold standard in 1971, deregulating financial markets, introducing program trading, etc. It may be that fractals before the crisis hit in 2007 are not that predictive, and fractals more than ten or twenty years ago reflect a different economic climate. You can say that human nature has continued the same, but the market structures have evolved and the consumer has switched from consumption to savings – a different context. So we are back to historical analogies of one-time events. The first chart from Ned Bushong shows where we are compared with the Nikkei off 1989, matching the peak in 2007 to the peak in 1989. He suggests we focus on the MACD line (bottom of chart) to show how the technical foundation of the market then is quite similar to ours today. 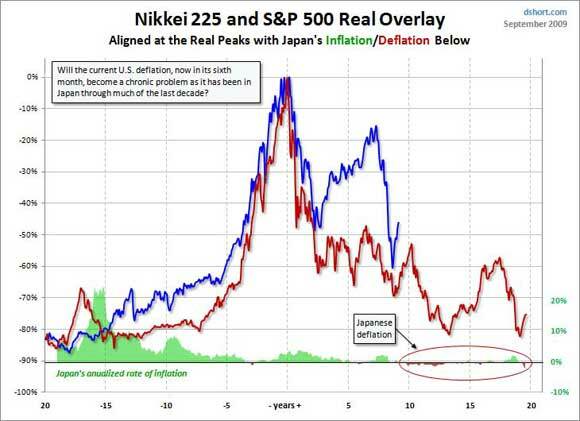 The second chart from dshort.com shows the S&P vs the Nikkei, centered on a 2000 peak not 2007 and adjusted for inflation/deflation. This is another way to look at the 1989 analogy. 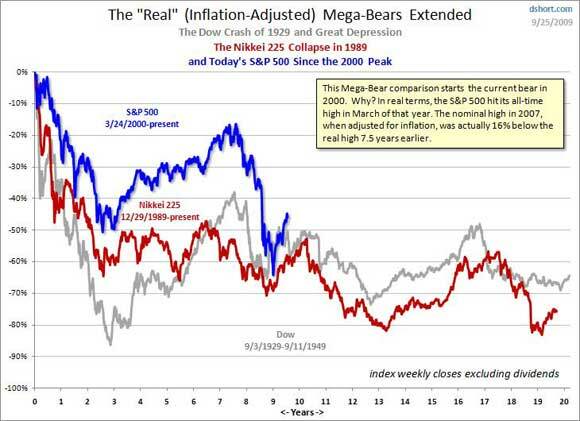 The third chart is another version of that 2000=1989 analogy, with deflation along the bottom. Doug Short has also shown a series of charts aligned not on 2000 peak but the 2008 bottom, which is a third way to look at this. 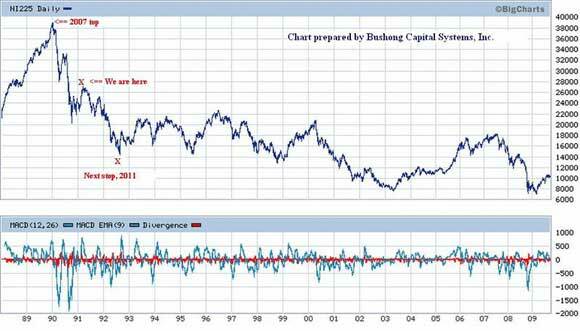 I have not seen him align the 2008 bottom with Japan’s bottom after the initial crash off 1989. Back then to Ned’s chart. It aligns 2007=1989. It captures a more similar political response (zombie banks and fiscal stimulus, a Full Hoover). It suggest the next wave down will arrive soon, and bottom around 2011. Japan continued fiscal stimulus until 1997 (2015 for us by analogy) and then gave up. The realized they had merely squandered huge resources and done no better than keep the patient on life support. They built the original Bridge To Nowhere. They cautioned the US not to do this, but we haven’t listened. Of course no analogy is perfect, and we should be cautious about extrapolating from one data point. There are many differences today than Japan 1989 – the most pessimistically being back then it was a problem centered on Japan, and the rest of the world could pull Japan out. Today it is a problem centered on the US and spread throughout the world economy, and it is doubtful anyone else can pull the US out.